Few remember (I didn't even know it, honestly) that right after the end of the Apollo missions, NASA put in orbit a spacious, technologically advanced space station, named Skylab, which stayed in orbit from 1973 to 1979. 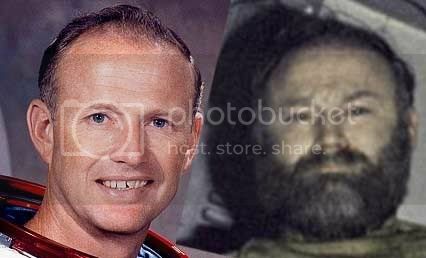 Only recently I found out this interesting page that I believe demonstrates how Skylab was, naturally, yet another NASA propaganda hoax. (Linked website is in Russian, I pointed to the Google translation of it. Here's the original page: http://manonmoon.ru/book/25.htm). Just like Apollo, it was obviously meant to keep the funding coming to the Agency, while insisting on the propagandistic idea of an ongoing "space battle" between superpowers that, having the generous goal of furthering human knowledge, excused for all the other shameful and greedy activities of said superpowers, such as the Vietnam war or the Afghanistan front or the widespread corruption. 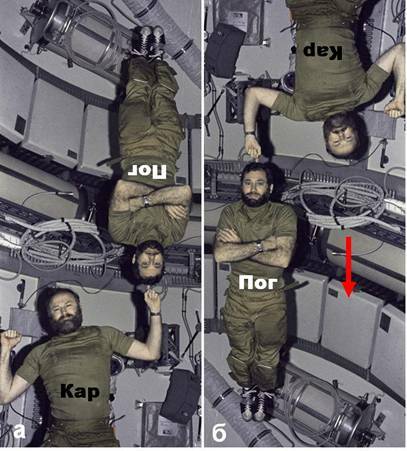 "Kap" is obviously hanging upside-down, isn't he? I wouldn't necessarily doubt the idea right off the bat, but I personally don't quite see what you see. What about Log's pants? Do you suggest he has also hung upside down and they are photoshopped together? That actually could be if you see both of them as individual incidents pasted together. Anyhow, they are able to simulate a lack of gravity with special airplanes that dive at free fall speed. Continue to present evidence. Sometimes you sense something that others don't and there may be a reason. I am very open to the idea if compelling evidence exists. We have seen the Chinese doing some pretty funny underwater scenes they claim are "outer space." Last edited by hoi.polloi on Sat Apr 07, 2012 5:53 pm, edited 2 times in total. Here is a larger picture of the same. 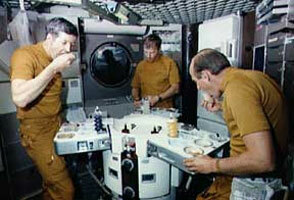 Skylab 4 commander Jerry Carr joking with his crewmate Bill Pogue. Carr is demonstration how easy it is to balance a crewmate on one's fingertip in weightlessness. Pogue is the younger guy who appears upside down here. But I don't see his pants as hanging upside-down, only creased. What gives it all away, I believe, as it always does with all the upside down people pictured in gravity and then reversed, are the eyes. While Pogue's expression is awfully "normal"... the eyes of Carr are half-closed from the bottom, his cheeks look as if they are puffed right under the eyes... maybe I'm wrong but I think this is the facial trademark of the person hanging upside down. And why would his legs not be visible in picture? This had been apparently sent up in orbit already mounted and ready to be used. One wonders, as always, why 40 years later we are stuck with the modular cubicles of the present-day orbital station. ...right out of Kubrick fantasies. Interesting. I see what you mean. Yes, it does seem feasible for the guy behind 2001 and possibly the moon hoaxes to tighten up their aesthetic and make Skylab. It certainly looks inspired by Kubrick. Even if it has nothing to do with Kubrick, it does seem quite fantastic. Aah, those were the days...They sure don't do them bat-winged astro-nots anymore. Gross! It's like someone is ripping off his arm like a holiday turkey leg! Just one more twist - pop! Incidentally, I have been spending more time with that picture of Pog and Kar and the lighting is quite strange. It almost looks like the picture's background was flipped upside down rather than the picture actually being taken upside down. Apparently, only humans cast shadows in space... or am I just reaching here? StillDiggin wrote: Apparently, only humans cast shadows in space... or am I just reaching here? Reaching? Not at all - as far as I can see: only humans project shadows inside the Skylab. Objects don't! Skylab was damaged during launch, we are told. A solar panel and part of micrometeoroid/sunshield ripped of, causing the thing to heat up with no sufficient power to cool it. The first mission was delayed while engineers came up with a fix and the first thing the crew of skylab 2 did was to fix it by - among other things - deploying a sunshade above the damaged region. Which helped cool things down with enough energy to spare for almost normal operation. They probably had a tough job facing such high wind-speeds, considering they where trained to work in vacuum. This "documentary" is a mine of horrible videos from the Skylab. 2 Movies Trailers on "Skylab is Falling". Some dates following the event. Cold War, "Nuclear Threat", Space and 9/11. Soviet war in Afghanistan. December 24th 1979. Reagan announces SDI on March 23rd 1983. "START I" Treaty is signed July 31st 1991. Dissolution of USSR December 26th 1991. MIR/Peace is "brought down" on March 23rd 2001. SDI/BMDO change it's name for Missile Defense Agency in 2002. "New START" Treaty signed April 8th 2010. They had an entire gymnasium-sized exercise room in Skylab! Wow. I remember in my pro-ISS days I posted a message on a Space forum asking if NASA would ever envision creating an exercise room module on the ISS. Little did I know, they had already built one back in the 1970s! Also as to the "mechanical" theory to create zero-gravity here on Earth, I read that one could technically create a weightless environment using centrifugal force, but I don't understand how that could happen. Just imagine a clothes dryer, how it spins, up and away from gravity, and also down and towards gravity. The turning device is in the center of the object being turned. With 'Centripetal Force for Circular Motion', if it is fast enough at a constant speed, the object inside a container being spun will stay in the one spot against the side of the container or a dummy fake space station. However because of the 'Centripetal Force Principal', the object inside the container has a tendency to move towards the center of the container, thereby creating its own center of gravity within the container. Remember the object would stay in the one spot against the side of the spinning container, unless another external force pushes the object towards the center, an inanimate object cannot push itself away from the side of the spinning container, however a human has its own external/internal force, to push themselves, and other objects, as is shown in the fast spinning dummy International space station. Astronauts use the force of their legs or arms to push themselves & objects to the center or away from the sides of the dummy space station, and the astronauts and objects move, or float within the center of the spinning container. How can an object spun around have "a tendency to move toward the center of the container"? Is this hogwash or is there any solid physics behind this statement? CitronBleu wrote: Is this hogwash or is there any solid physics behind this statement? The NASA claims - and the silly videos they make - are ALL a load of hogwash, Citronbleu - bubbles and all. You may wish to check out the vast evidence provided in this forum for more answers to your questions. simonshack wrote: The NASA claims - and the silly videos they make - are ALL a load of hogwash, Citronbleu - bubbles and all. I am sure they are simonshack. I've been through the majority of posts in the Apollo forum, and taken the time to do so. It's a fascinating topic. I am not questioning the validity of the claims made on this forum. I have a physics question about movement in space and another about the simulation of artificial gravity here on Earth. I am only trying to understand. 1. What physical law explains/demonstrates the impossibility for an astronaut to jog/run in a man-made space module, as the above video purports to show? The author of the video claims this is demonstrable proof of the unfeasibility of human space travel as shown in the SkyLab footage. 2. The same author also claims artificial zero-gravity can be created on Earth by the "centripetal force principal." I don't understand how an object spun around can "have a tendency to move towards the center of the container, thereby creating its own center of gravity within the container." Anybody care to explain? It would seem to me that in a true Zero-G situation that your first step would launch you straight up or in some upward direction. The only thing that allows you to jog on earth is gravity bringing you back down. In some of the ISS footage I have seen regarding exercising in space, they have changed it to a more 'resistive' type of strength training to make it seem more believable. 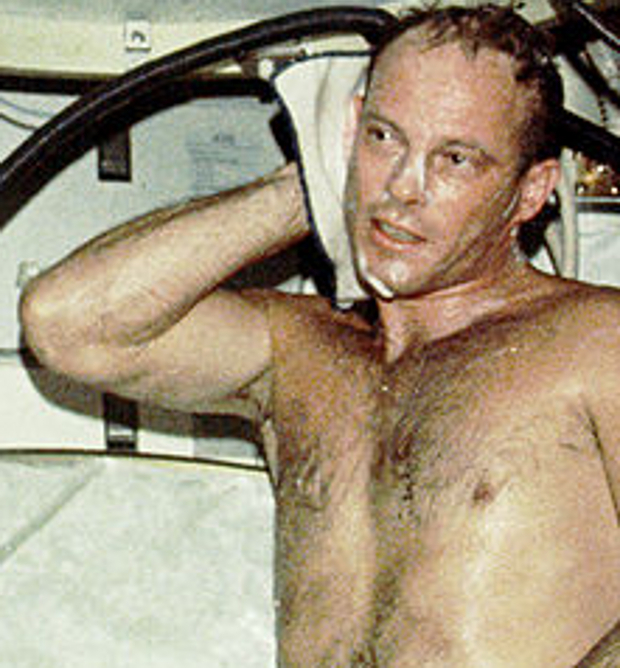 Of course, some of the astronauts "vogue" to purge the nitrogen from their bloodstreams before spacewalks. Hey, was that another bubble I saw to the right of the screen at about the :13 to :15 second spot toward the right of the screen? Edit: Man... Now that I think about it, the situation I posted in this post below would also therefore be impossible regarding Kelly's exercise. What force causes Kelly to drop back down to pull himself up with these 'springy cords' he is tugging on. He doesn't appear to be exerting any downward resistance to allow him to drop and gravity should not be in effect to allow him to perform this. Original post viewtopic.php?f=23&t=720&start=555 video provided below.